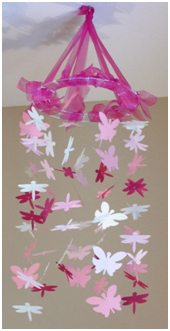 If you have access to a die cut machine, these paper mobiles make a unique and inexpensive baby shower gift. If you know the mom-to-be’s nursery décor, you can even customize to match. 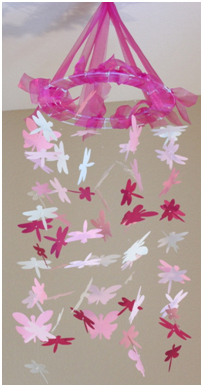 I used butterflies and dragonflies for my baby girl’s garden-themed nursery. For a baby boy, you could use moons and stars. 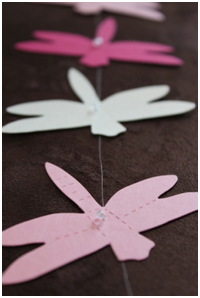 Use light-weight cardstock for your die cuts so the shapes will flutter and turn as you create air currents when you walk into the room—so pretty! -50 to 100 die cuts in color(s) and shape(s) of your choice (You can either purchase these or make your own using a die cut machine). 1. 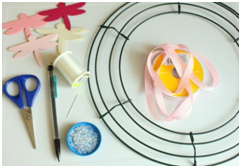 Spray paint your wire wreath white or the color of your choice. Allow to dry overnight. 2. Cut a piece of transparent thread about 4 feet long. Using a double knot, tie a bead to the bottom of the thread. 3. Depending on the shapes you choose, you may need to determine where you want to place your hole so the object is oriented up, not down when hanging. To practice, mark the center of the shape with a pencil, thread the needle with the clear thread through, and allow the shape to hang on the bead. Reposition your hole until you are satisfied with the way it hangs, then use this shape as a guide when piercing the rest of the die cuts. This step is not necessary if you choose a more symmetrical shape. 1. 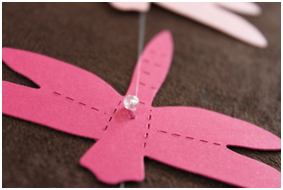 To make each strand, use a 4 foot long piece of clear thread, tie a bead to one end and then thread a die cut so it will rest on top of the bead when hanging. Then thread another bead and double knot it about 3 inches above the previous die cut. 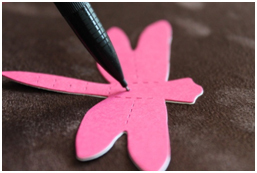 Add another die cut (alternating colors if desired) by threading it with the needle and repeat until you have 8 die cuts. 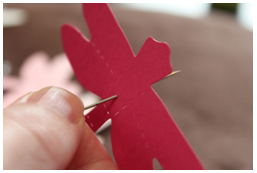 End with a bead knotted on top so the last die cut won’t fall off if it drops. Leave some thread at the end of the strand for tying to the wreath later. 2. Repeat step 1 for as many strands as you want, the more the better! I used 6 strands for a total of 48 butterflies and dragonflies. You can add more strands or make the strands longer or shorter depending in the size of your wire wreath or where you plan to hang it. 3. Tie each strand evenly spaced around your wreath. 4. Cut 4 pieces of ribbon about 2 feet long each. Thread each one through the middle wire of your wreath so they are evenly spaced around. Bring the pieces of ribbon together at the top and tie in a knot for hanging. 5. Cut pieces of ribbon about 6 inches long and tie the pieces around your wreath to decorate it, if you like. 6. Hooray! You are all done! If this is a gift, be sure to include the tea cup hook for hanging.